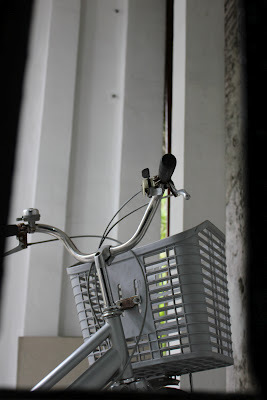 We finally pursued our plan to visit Intramuros and the old buildings within its walls. 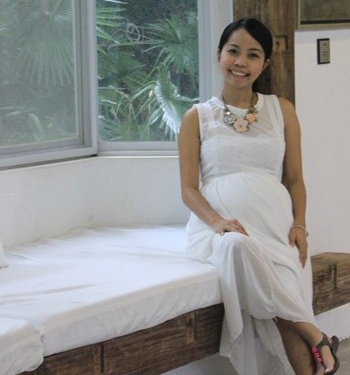 The idea of visiting the place came to me when we had a dinner with our Chinese friend Vincen last December. Vincen works with my husband for a project here in the Philippines. 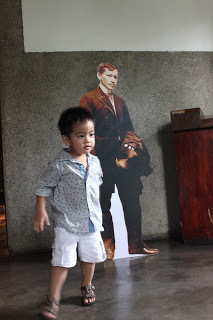 I then suggested that he should visit Intramuros so he could see some of our cultural heritage. We always take our little boy with us whenever we see a ‘window for learning’ to the places that we plan to visit. 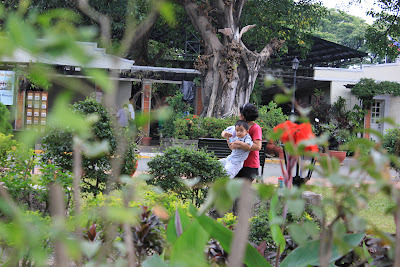 I was especially excited to take Kyle to Intramuros as it was going to be his first historical tour. 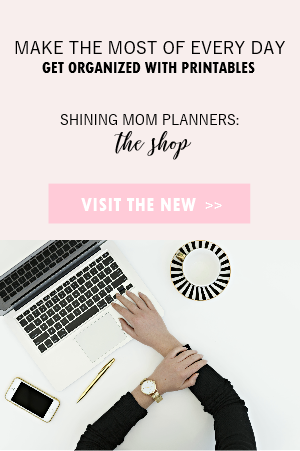 I wanted him to see old buildings. 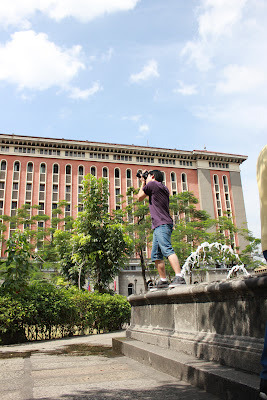 I knew taking Kyle to the “walled city” will give him opportunities to experience the sights and feel of the old Manila. So how was the tour? 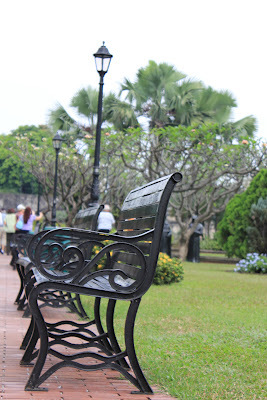 We went to Fort Santiago, one of the best-preserved medieval cities in the world. 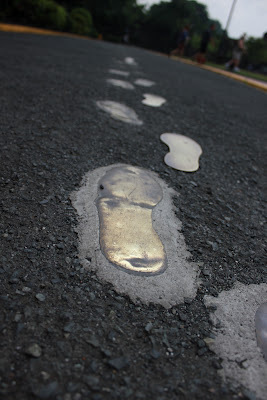 Stepping in the area made me feel like being transported back to the Philippines during its Spanish colonial era. 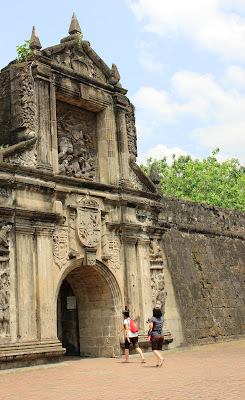 Fort Santiago (Fuerza de Santiago) was a defense fortress established by Spanish conquistador, Miguel López de Legazpi. 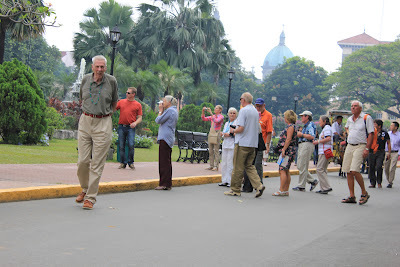 The arch entrance to Fort Santiago is 40 meters high. Its architecture is a reflection of the history and heritage of the country. The Fort is the citadel of the walled city of Intramuros. 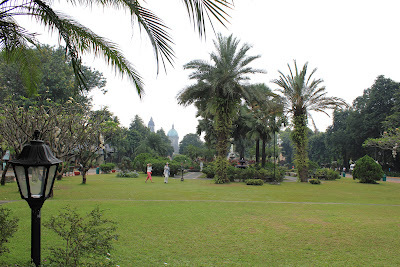 Upon entering the narrow arch is an expansive lawn where Rizal’s Shrine is. Kyle enjoyed skipping, hopping, running and playing at the beautiful garden. The garden was in lush greens. There were a lot of tourists in the area. 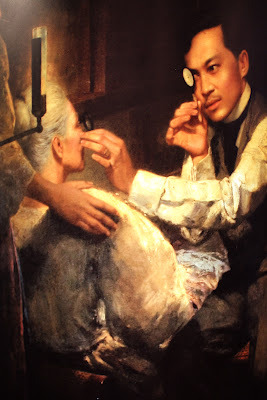 We also went to Rizal Shrine where our national hero spent his last night and where his family later found the famous poem Mi último adiós (My Last Farewell) concealed in an oil lamp. 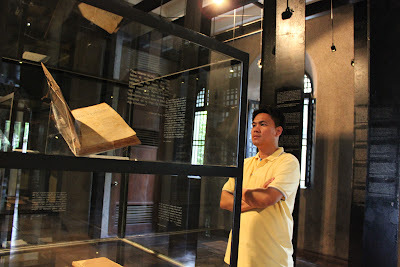 The shrine is home to various memorabilia, books, manuscripts and artworks belonging to Dr. Jose Rizal. 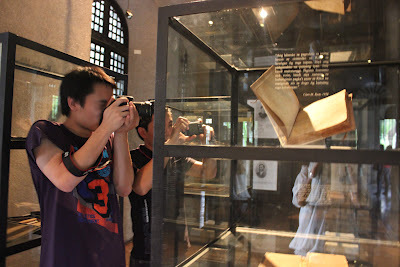 Vincen and Gilbert taking a photo of the famous book. The original copy of Mi último adiós. 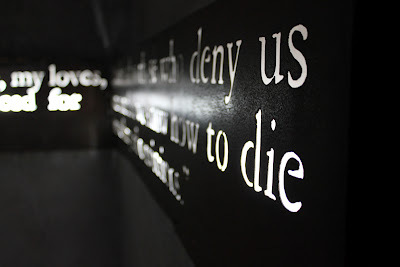 Writings inside the Contemplation Room . 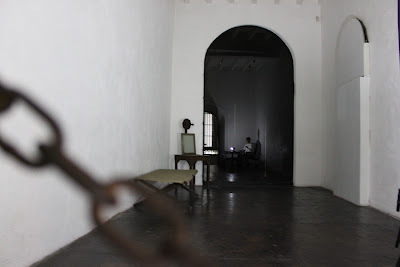 The prison cell of Jose Rizal . Kyle met our national hero. his final execution place at Bagumbayan in Rizal Park. 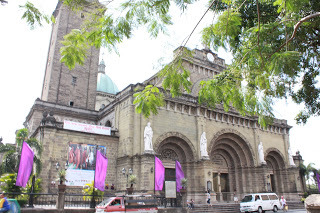 Our next stop was Manila Cathedral also known as the Cathedral-Basilica of the Immaculate Conception. The cathedral served both as the Prime Basilica of the Philippines and highest seat of the archbishop in the country. 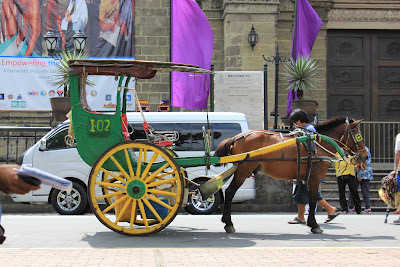 You can have a tour in Intramuros for 300 pesos per 30 minutes riding in this kalesa.